Two brothers from Hampshire have been banned for five years from owning or keeping horses. 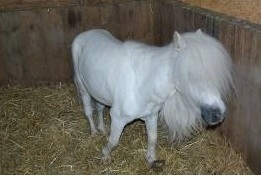 It's after two Shetland ponies in their care were found to have such overgrown hooves they could not walk. Matthew Twigg, 56, of Walworth Road in Andover was also given a custodial sentence of five weeks suspended for 12 months and his brother, David, 47, was ordered to do 65 hours of unpaid work after pleading guilty to causing unnecessary suffering to the ponies. They were also ordered to pay £2,726.94 in costs. RSPCA inspector Will Hendry visited the house on 9 September 2013 after concerns were raised about the ponies, a 25-year-old male grey Shetland called Merlin and a 15-year-old female grey Shetland called Hobby. Basingstoke Magistrates’ Court was told that when Merlin was examined by a farrier and a vet he had been in such severe pain that he had to be put to sleep to end his suffering. X-rays later showed that the pedal bone in each of his feet had started to disintegrate due to chronic laminitis. Hobby was taken to an equine hospital the next day where she was exhibiting signs of extreme pain in all four feet. Her X-rays also showed that the pedal bones had rotated and started to disintegrate. She was also put to sleep to end her suffering.